A lively anecdote from the noted Whitby photographer Frank Meadow Sutcliffe, published in Amateur Photographer on March 6th, 1902. “There are two piers at Whitby, which, though starting from points widely apart, almost touch each other where they end. The one pier is given up to fashion and frivolity, the other is deserted, except by fishermen and photographers. One evening last summer, when the band was playing “Ehren on the Rhine,” an’t the sitters on the seats were tapping their feet on the ground to prevent the band playing out of time, a solitary photographer might have been seen on the other pier unpacking his apparatus. At last he had got it all unpacked, and his polished mahogany camera and lens “shone like a burning flame together” in the rays of the setting sun, towards which it was pointed. Slowly the sun sank, till it nearly touched the sea. What was the solitary photographer going to take at this time of night? The crowd on the other pier began to be interested in him. Soon the end of one pier was crowded with people watching the solitary photgrapher on the other pier. “He expects a ship coming in,” said one. “No, he is waiting till the lamps are lit,” said another. “He wants to take a moonlight photograph,” said a third. “No, he wants to take the sun as it dips into the sea,” said a fourth. “What beautiful legs he has got! ” said a fifth. “Yes, but his coat does not fit,” said a sixth. “And his ears stick out,” said a seventh. “Look! Look!” said everyone at once, “he is taking off the cap.” And so he was, but just as he was putting it on again, the cap fell down on to the pier; it fell on its edge and began to roll. The photographer looked at the rolling cap, then at the lens, undecided whether to rush for the cap and put it on the lens, or to take his coat off and throw over the whole camera. He decided to run after the cap, which by this time was perilously near the edge of the pier. As he did so, one of his legs got entangled with one of the tripod legs, which had called forth such admiration from one of the crowd. Down came the tripod, camera, and all, with a crash; the cap gave a little jump and went into the sea. The photographer stood aghast. The crowd cheered to a man. 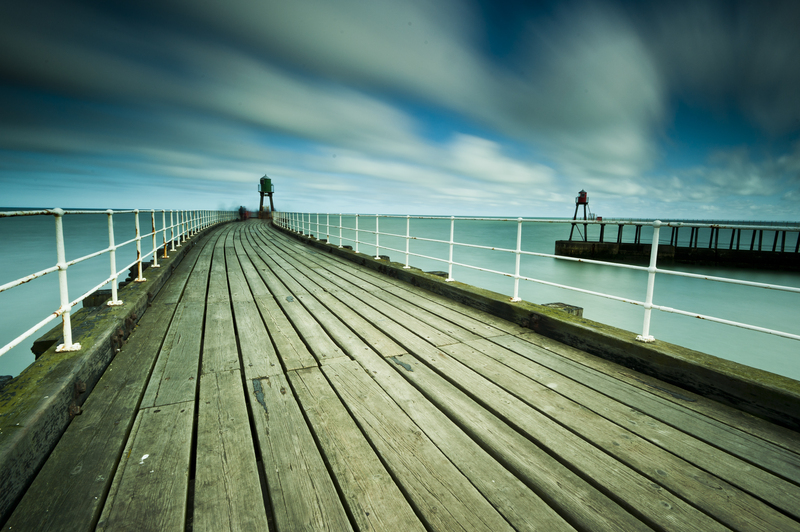 Image from a trip to Whitby in April.